An extraordinary evening at Teatro Verdi enjoying the stunning, breathtaking performance of the young musical genius, Giovanni Allevi. I never expected Florence would quench my passion for opera, classical music and my thirst for music in general. Because Florence is reputed primarily as an art-history rather than a music destination, its rich, musical repetoire goes relatively overlooked and unnoticed in comparison. That is, except by the locals. And perhaps that is what makes musical events in Florence so special, because they retain their neighborhood identity and don't tend to attract tourists. The theaters are perfectly small, located on side-streets and overwhelmingly ttended by residents. Among these theaters are Teatro Verdi, Teatro della Pergola, Teatro Goldoni and Teatro Puccini. Each one has a unique history, all are small scale, intimate but characteristically ornate venues that feel more like cozy informal social halls for the neighborhood residents. There is alot to be said about the audience. There is a special spiritual dynamic that reveals itself within a musically cultured audience. And this is where I find that Italy stands out. Nowhere have I seen audiences that have such a tight knowledge and appreciation for the artist and his music. I feel it here even in the smallest of Italian theaters, moreso than at grand operatic venues such as The Met. Here it emanates from the very gut of the culture. 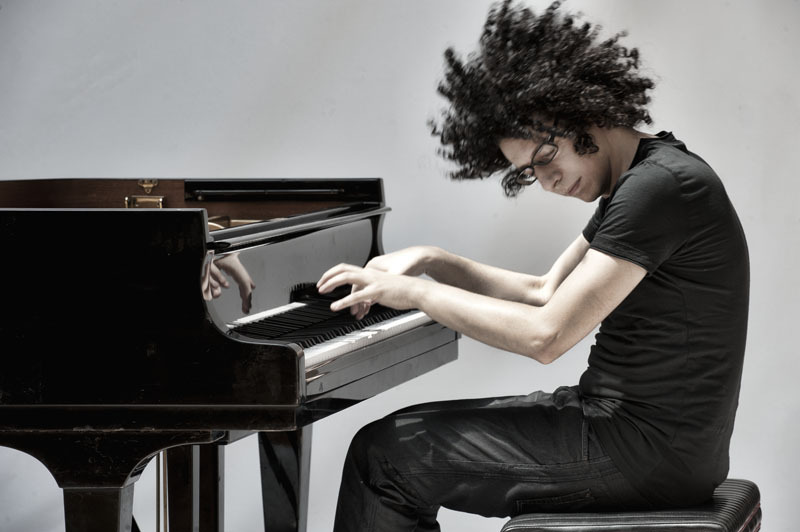 But tonight's performance was all about this beyond-human being, this phenomenal prodigy Giovanni Allevi, who blew the audience away with his mind-boggling musical genius. Why would I need to go to Milan, Vienna, Prague, Verona, Naples for music when I have this right around the corner?